Rose Cottage is a purpose built, two story, modern self catering cottage. It was built for me and my English husband by my cousin, relatives and friends as a self catering holiday cottage. This allows for a much more affordable 'long stay' holiday. It is located in the small village of Bitaug in the province of Enrique Villanueva, the village I grew up in. It is quiet and unspoilt here with the local white sand beach just a few metres away. Tata runs the local 'Sari Sari' store and her husband works as a policeman at the local police station. They are always helpful for you if you need anything. Rose Cottage has a 25 square meter lounge which incorporates a small but well equiped kitchen. A cool, fully tiled floor leads out onto a covered patio where you may greet friends or have breakfast. Out the back is our covered bar-be-que area, my husbands favorite. The perfect place to cook that fresh caught seafood. Lobster, Tiger prawn, Crab and red snapper are all readily available at the local market for around £1.50 a Kilo! If you like to barter or greet the local fishermen as they arrive, maybe even cheaper! Upstairs is another large room. A fully airconditioned 25 square mtrs bedroom, complete with ensuite shower and separate flushing toilet. A balcony off the bedroom gives a view over the fields, with sea views from the rear. This is currently set up as a double bedroom, but could easily accommodate two singles and a cot. We charge only one rate for the cottage, 700 Pesos per night. (Currently around GBP£7.00) . We do however charge for electricity used to cover the use of the airconditioner, etc. 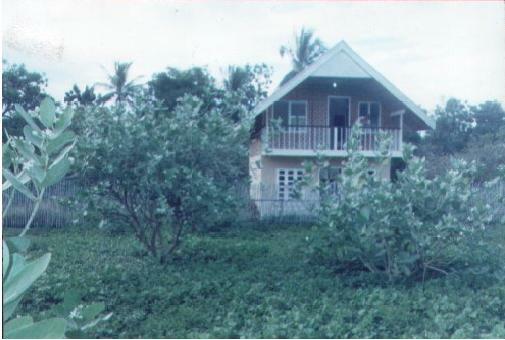 Our Cottage is approximately 8 kilometers from Larena. We are located between Larena and Enrique Villanueva, close to the Tulapos Marine Sanctuary. Also, we are within walking distance of the local beach, our neighbours Hard Rock Cottage restaurant and Bruce Mattingley's Kiwidive resort. Siquijor is a beautiful Island and our comfortable cottage is an ideal base for exploring without being tied to one resort and thier restaurant. Most resorts allow 'walkins' from tourists, to use thier facilities for a small charge.